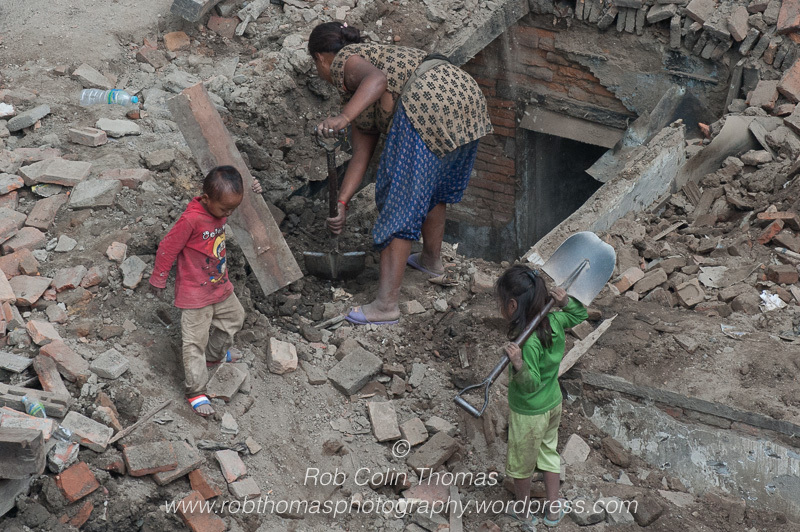 Family recovering and removing materials from a building destroyed in the Nepal Earthquake of 25th April 2015. 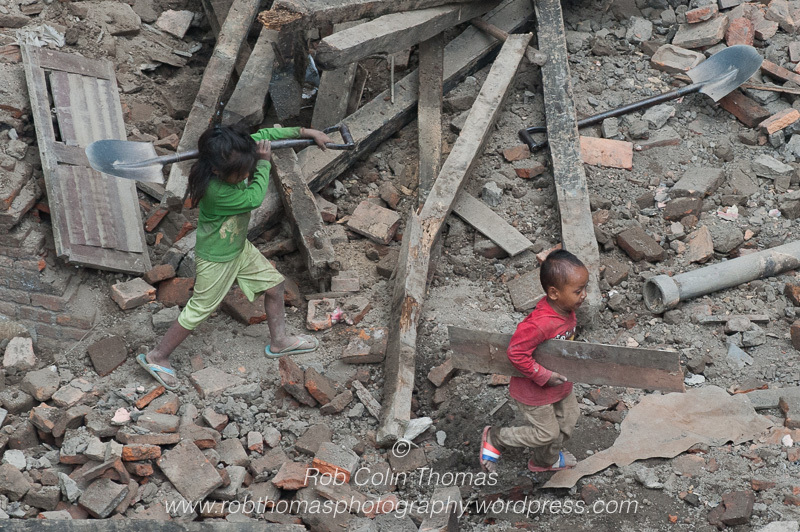 It is nearly 5 months since the devastating earthquake hit Nepal. Life appear oddly ‘normal’ on the surface. Kathmandu is still lively, noisy and eclectic. Although I have been told it would normall be very lively, very noisy and very eclectic were it not for a ‘perfect storm’ of natural and man-made disasters. 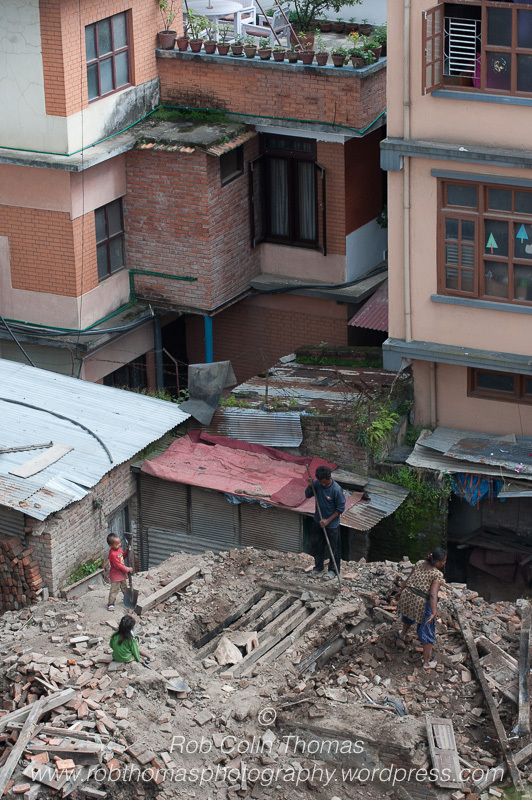 The earthquake happened just before the monsoon period. 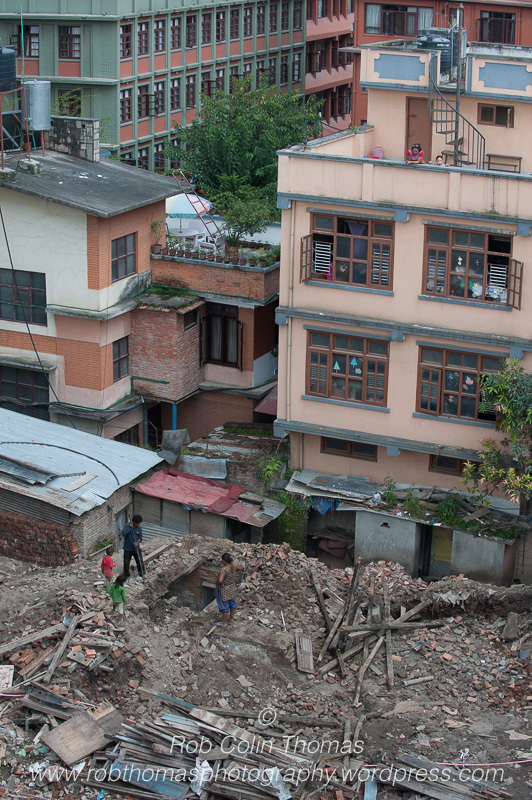 The heavy rain from this annual event excerbated the poor recovery from the quake. Especially in the hills and mountains of Central Nepal. For 2/3rds of the journey from Kathmandu to Pokhara the bus passes many ‘tents’ outside what appear to be perfectly normal houses. These tents are the sleeping accommodation for the building owners and occupants, too nervous to stay inside overnight as they structures are damaged too badly to be reliable in the continuing after shocks. Politics has been a major issue in the region for 30 years, and probably much longer. But the current situation of disputes between national and local parties over the constitution has led to a series of strikes. One, currently ongoing in the Tharei Region, is well over 3 weeks long, and causing mayhem at the land borders with India. The consequnce is rising food and fuel prices. That is the ‘man-made disaster’ – and I can find absoluetly no logic for it. Businesses are doing there best to attract custom. But the major custom is from tourists. A few brave the situaltion, greeted not by the usually high energy haggling, bartering and cajoling, but by an almost stuporiphic malaise. People sitting in doorways, on bicycle-riks, street stalls, just looking at you and pleading silently to buy something. Gradually you notice the damage. The gaps in the buildings that remain standing. Piles of bricks, wood and any other materials by the street, recovered and ready to be recycled. 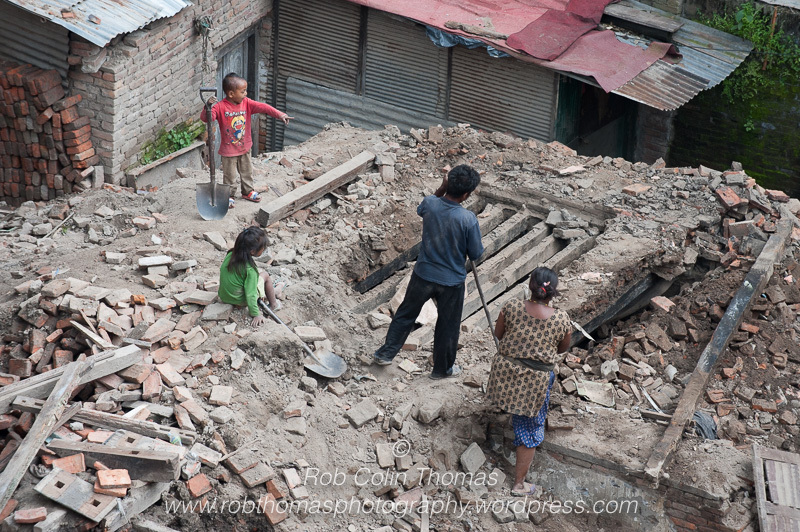 Some of the ‘gaps’ the work of removing the rubble can be seen, ongoing, between the intemittent monsoon downpours. I watched as a family of four spent 3 hours toiling to carry out this back breaking work. 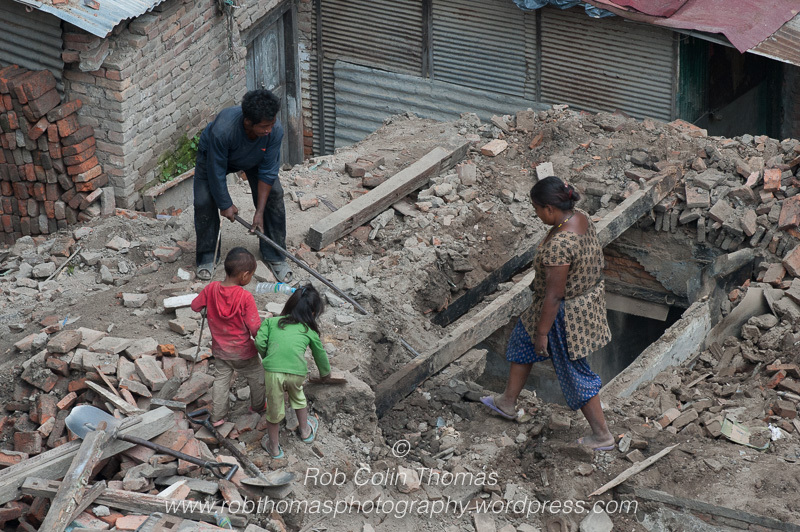 The ‘heartbreak’ was seeing not just the parents, but their 2 children working and helping them. The children could have been no more than 3 and 5. The inspiration was watching how they were still a family. No harsh words from the parents. No tantrums from the children. They were all just doing what needed to be done. The sadness is that these are probably migrants from the countryside. It is very unlikely they were working on their own property and land. 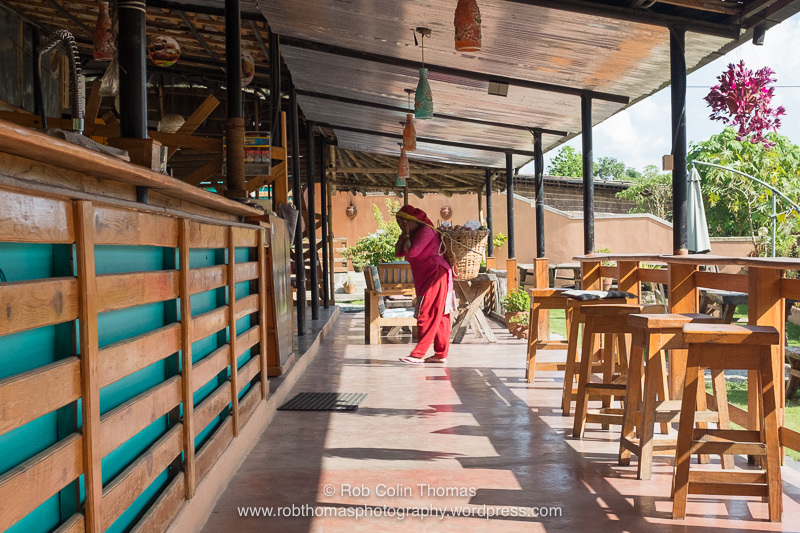 They will have joined many others in moving from their villages and farms in the hills and mountians surrounding the Kathmandu Valley to find some income and some form of livelihood – however temporary. 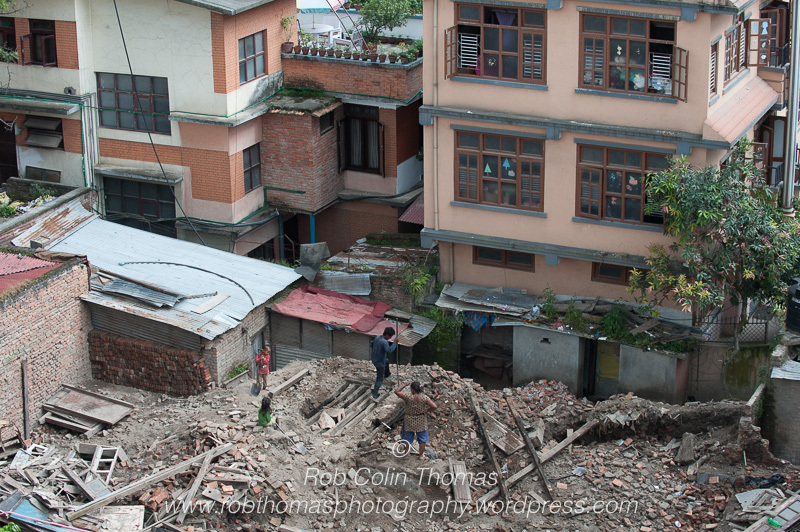 What is shocking is that they have almost certainly left their own propertes and fields as they have been completely destroyed in the quake with no other way of making any money to sustain their lives other than head to the city and find something. To consider that this work is preferable to staying in your own home area is beyond my comprehension. My time here is nearly over. I return to a ‘comfortable existence’, as many tourists do. But my memories will be filled with images, such as these, along with a myriad of conversations with people who have really lost everything. Nepal needs tourists. You will receive the warmest of welcomes and the most radient of smiles.